If it’s time to buy a new mattress, it’s very important that you do the research you need to be as successful as possible. You don’t want to purchase the wrong mattress because you were underprepared for the decision-making process. There are now hundreds of mattress companies in the United States, which means you have plenty of choices if you want to purchase a solid mattress. But this also means that your decision will be much harder. You can now afford to purchase a luxury mattress for a relatively small price. Bear Mattress is a company that has been in the industry for around 25 years. They have a very basic approach to business which helps them lower their costs. They offer one primary mattress that has proven extremely popular with customers. They have a recipe for success and see no need to change it. They use eco-friendly materials to produce mattresses from a range of different foams and materials. This review is focused on providing you with as much information as you need to make the best decision possible. If you’re someone who values understanding products you purchase, make sure that you take this review seriously. Below we will explore everything you need to know about the Bear Mattress and the company that produces it! Should I Buy a Bear Mattress? The construction of the mattress is vital in understanding whether the mattress is right for you or not. Modern mattresses can be designed in a multitude of different ways. The Bear Mattress is designed using a range of different foams and materials. This section is dedicated to exploring the construction process in more detail, check out all the information provided below. The top layer of the mattress is what provides you with comfort. 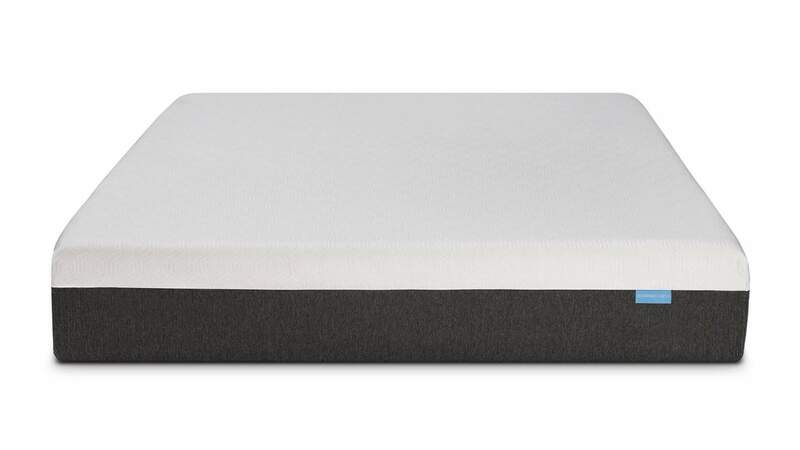 This mattress layer is made from 1.5” of graphite infused memory foam. This memory foam provides hug and contour to your body, but is also designed to not retain too much heat. 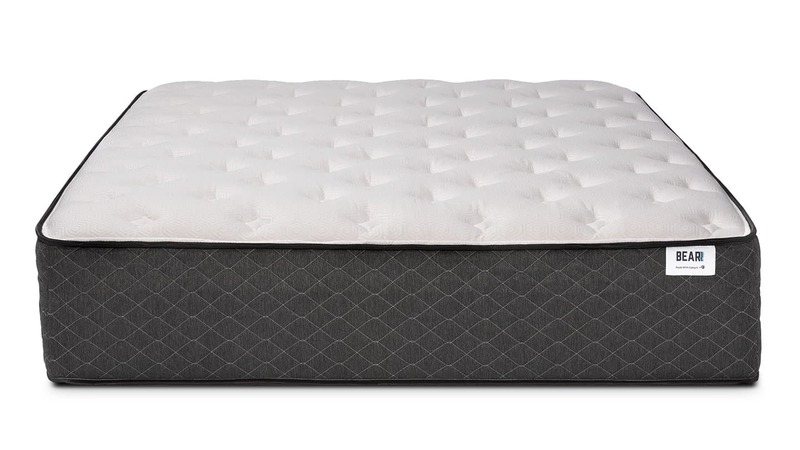 If you’re someone who wants to enjoy the luxury of a memory foam mattress, this layer is exactly what you’re looking for! This layer is made from Bear-manufactured response foam – it is 1” thick. It provides resistance and transition for the rest of the mattress. It’s this layer that provides the mattress with a bit of extra bounce. It’s vital in ensuring you don’t fall too far into the mattress. The bottom layer is the support layer of the mattress. Without this layer, you wouldn’t be able to sleep on the mattress without sinking through to the bottom. It’s made form 6.5” of highly-dense poly foam. This layer allows the rest of the mattress to prioritize comfort. The cover of a mattress is often overlooked, but it’s actually a crucial component of any purchase decision. If a cover is too weighty, it might cause the mattress to retain heat. 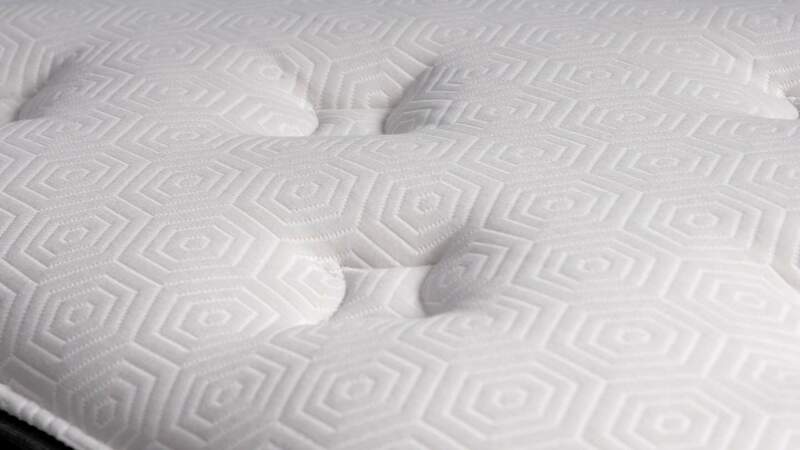 The cover of the Bear Mattress is thin in order to prevent heat retention. It’s made from a material called Celliant, which turns your body heat into infrared light – this allegedly helps blood flow and circulation. This is a nice added benefit that you don’t see in many other mattresses. The most important part of any mattress is how it feels and how much support it offers. The Bear Mattress gives you the advantage of sleeping on a memory foam top layer – you feel as though you’re sinking into a cloud when you lie on it. 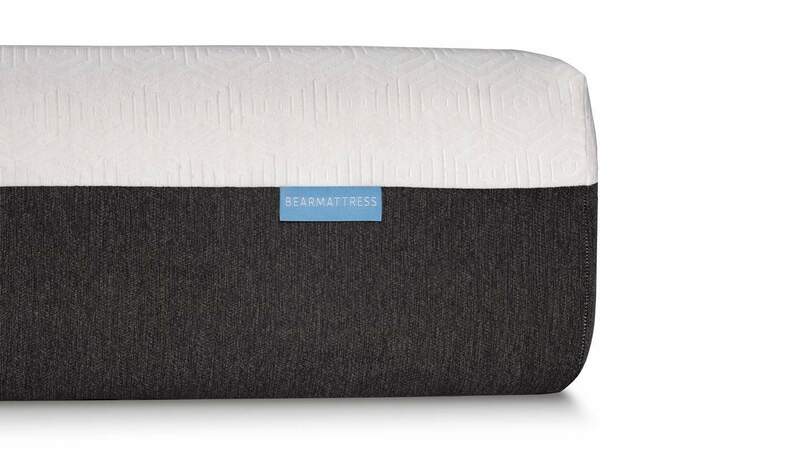 Unlike other memory foam mattresses, the mattress at Bear Mattress does provide plenty of resistance and breathability – benefits that you can’t find in many other places. In terms of support, this mattress comes in at an above average support level. If you’re looking for an extremely soft mattress, this might not be your best option. We rate this mattress at about a 7/10, meaning it is slightly above average in terms of support. If you’re someone who weighs over 220 lbs., you might want to find a mattress that has even higher support levels. Edge support on the mattress is also surprisingly good. You won’t have to worry too much about different support levels throughout the mattress. This is a benefit you don’t find in many memory foam mattresses. The Bear Mattress company has been around for 25 years – in this time they have made a number of changes to their mattress. Their aim has always been to provide the most advanced mattress possible for an affordable price. Recently they introduced the Celliant cover to their mattress. Keep an eye on this company, they’re always evolving. Sinkage is the amount the mattress sinks when you lie on it. It’s a good indication of how much hug the mattress will provide when you sleep. To measure this, we used concentrated weights and tested how far into the mattress they fell. A 5-lb. weight sank 1” to the mattress. A 10-lb. weight sank 2” into the mattress. A 50-lb. weight sank 4” into the mattress. These are moderate levels of sinkage. While having a comfortable mattress with plenty of support is a good start for those who want to make a good buying decision, there’s a lot more that goes into the value of a mattress. If you want to purchase a mattress that is truly a good deal – you need to consider all the other benefits and features that you’re afforded with the mattress. There’s no point purchasing something that doesn’t live up to industry standards. With the number of competitors in the marketplace, you can now find a range of benefits included with many mattresses. This is one of the many ways that mattress companies attempt to differentiate themselves from other mattress firms. These benefits can end up saving you thousands of dollars in the future, so you want to be certain you pay close attention to them. It’s also important for understanding if a mattress company is the type of firm you want to work with – you can tell a lot about a company by what they offer you. Below we will explore all the benefits and features associated with Bear Mattress. The warranty included with your Bear Mattress is one of the most important benefits associated with the mattress. Without a warranty, you won’t be protected for damages or issues with the mattress. Purchasing a new mattress isn’t cheap, so if you want to make sure you’re covered in the future it’s essential that you have a long warranty. With the Bear Mattress, you’ll receive a 10-year warranty to cover the replacement of your mattress if you end up having any problems. This mean that you can return any faulty mattresses for a new mattress if there is a problem in the next decade. This is in line with industry standards. Another important component of a mattress’ value is how long the trial period lasts. If you’re someone who is ordering a mattress online, you’re probably wondering how you can be certain that it will be comfortable. Bear offers a trial period where you can sleep on the mattress for a number of nights before you decide if you want to keep it or not. You can keep the mattress for 100-nights before you have to keep it. Mattresses cause a lot of damage to the environment – if you think about it, every time you throw a mattress away you’re putting a lot of harmful materials into landfills. If you want to purchase a mattress that uses eco-friendly materials, the Bear Mattress is a good choice. It’s also healthier for you and your family. When you purchase a mattress that has a lot of chemicals, you will be exposed to these chemicals over time – you don’t want to be harming yourself while you sleep. Bear Mattress isn’t completely natural or organic, but it does do a lot better than most traditional mattresses. Check out their website for more information about the eco-friendly products they use. It’s hard to find a mattress company that has a good customer service team. Because many companies try and cut costs, they often reduce the customer service options they offer their customers. If you’re someone who wants to be provided decent customer service from your mattress company, this is definitely one of the best choices. If you head to their website, you can find a chat server at the bottom left hand corner of the page. It’s a great way to get in contact with a live person on their team. Unlike many modern mattress companies that just produce mattresses, Bear Mattress also produces other types of items. You can purchase pillows, bed bases, and more directly through their company. It’s a great way to keep everything under one roof. If you think you would enjoy some of these other products, check them out on their website. If you want to work with a company that gives back, Bear Mattress is also a great option. They have a program that is geared towards donating money to charities and other community organizations. It’s their mission to give back the communities they work with. They have a particular focus on donating sports equipment and resources. They have donated over $20m in sports equipment since they started business. They’ve also given over 1,000+ donations to individuals and organizations. Purchasing a mattress from Bear Mattress means you’re working with a company that is focused on helping American communities – it says a lot about the type of company they strive to be. A lot of products are now made in overseas. It’s become much easier to manufacture in jurisdictions with much lower wages. If you’re someone who values boosting local economies in the United States, the Bear Mattress is a great option. They manufacture their mattresses right here in the USA. By supporting their company, you’re supporting local industries and workers. Bear Mattress is definitely a good option for those who want to purchase a memory foam mattress that also provides plenty of resistance. It’s also a very supportive mattress for those who value lumbar support while they sleep. Bear Mattress also comes with a range of additional benefits, such as a solid warranty and good return policy. You’ll also benefit from free shipping and eco-friendly materials. The price for what you receive is actually very good when compared to industry competitors. If you still think you would prefer a different type of mattress, don’t worry – we have plenty of great reviews on our website that you can check out for free. We’re a great resource for anyone in the market for a new mattress!